How Do I Request Great Design? What's the best way to request great design? It’s a fact that the better the request, the better the work from your designer. With that in mind, here are some tips to help you write a great request. There are two ways to request design. Email and JAR. To request via email, send your request to [email protected] However, using the request tool in JAR is simply the most effective way to communicate what you need with your designer. 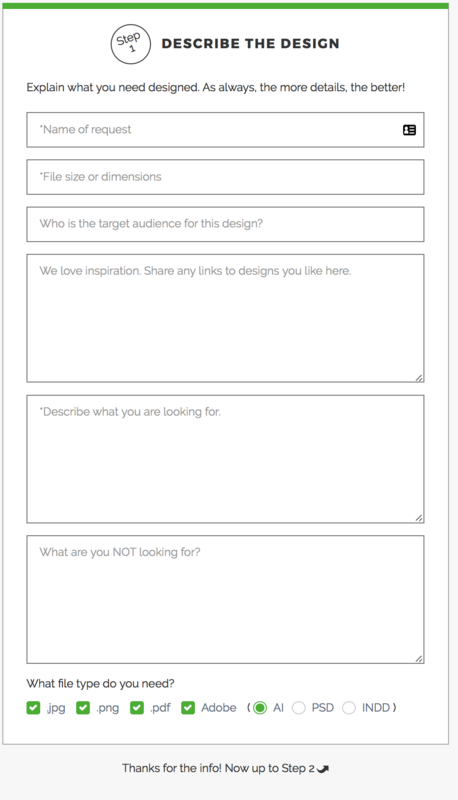 There are three simple steps to submitting a great design to your designer. That's it! Once you're done, simply review your copy & click "Pickle It"! Let's cover each of the steps in a little more detail. Step one is where you're going to give all the meaty details to your designer. In this section, you'll want to be as descriptive as possible. Tell us exactly what you want done. The more information, the better. You want your designer to have a very clear picture of what you want created. If your request is vague or not detailed enough, your designer might get confused and may force him or her to guess or interpret your request. This can possibly lead to you being not satisfied with your design. Please remember, your designer is NOT a mind-reader (yet). Give a ton of examples via uploads or providing links. Tell your designer what you love AND what you hate. Make sure your copy is proofed and READY FOR PRINT! Your designer will simply cut and paste your copy into your design. They won't make any adjustments to the copy. Protip: if you don't include your copy in the body of the request, make sure it is given to your designer via soft copy, such as a word document or a google doc. PDF's are problematic because it can be difficult for your designer to cut and paste the copy. They may be forced to hand type your copy which is not ideal and will likely lead to mistakes. In the request tool, you are given many fields to communicate your vision. Use them! Next up, photography. Using the Photo picker powered by Unsplash, Pixabay, and Getty, you can actually choose the exact photograph you want your designer to use. Stock photos from the Unsplash and Pixabay libraries are free and can be used for any purpose, including commercial use. Use of the Getty images library requires a Getty subscription add-on to your account. Rather have your designer find photos for you? That's not a problem either. Just tell your designer what you are looking for in the provided field. Your designer will search Unsplash for you. If you have access to premium Getty Images, your designer will search there too. Don't need any photos or would rather upload your own? That's fine too. 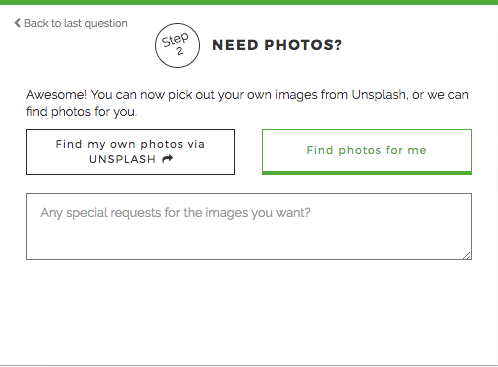 Just select "I don't need photos or I'll upload my own". Have assets like files, fonts, sketches, or any other files that are relevant to your request? Here's the place to upload them. 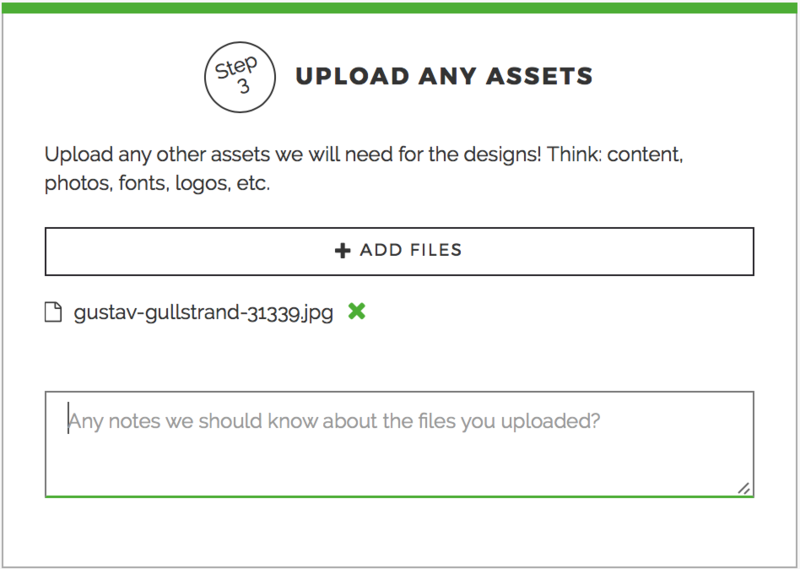 When uploading files, you are also given a space to give specific feedback or direction about those assets. Do you want your designer to pay close attention to page 4, or use the color scheme on page 6? You can tell them right there. Once you've described your project in detail, uploaded photos and files, simply click Pickle It! Your request will be sent straight to your designer! See below for a simple screencast, showing how to use JAR!